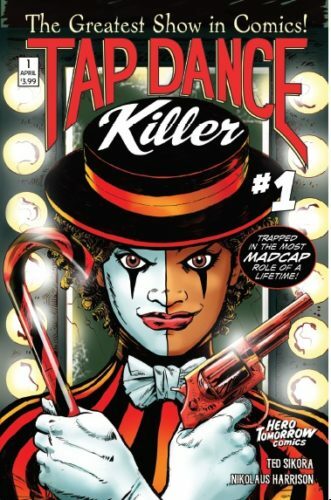 It’s appropriate that the cover for Tap Dance Killer touts that she’s trapped in the most madcap role of a lifetime. Something about it echoes “trapped in a world he never made,” the tag line of another Cleveland-based character, Howard the Duck. 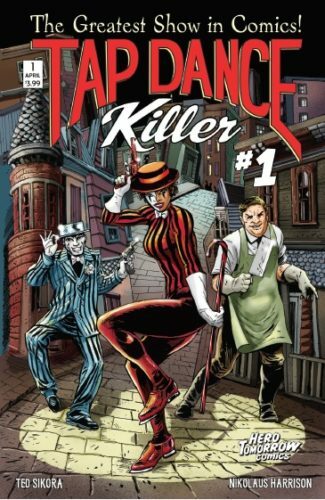 Tap Dance Killer isn’t the social parody that that beloved Marvel classic was, but it wouldn’t be hard to draw a direct line from Steve Gerber’s imagination to that of creator Ted Sikora. 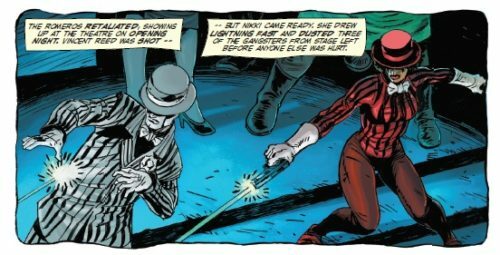 Both Tap Dance Killer and Sikora’s other book Apama are characters that are unexpected and fresh, even though you can see their lineage in Marvel Comics, theater, and rock. And that’s what will first catch your eye about Tap Dance Killer. Like with Apama, Sikora has found a collaborator that knows the artists of Marvel’s bronze age — Nikolaus Harrison has his own style, but often uses the straightforward but dynamic layout of the kind of comics we grew up reading. It’s often cinematic, and more impressively, taking risks with points of view. For a book like this, it’s exactly what’s needed. Though she’s recovered her sense of self, Nikki has been changed by her experiences. Sikora plays a bit coy with her abilities, because she’s still figuring them out herself. I described it as “the power of musical theater,” but he corrected me in a conversation. She has a fighting style enhanced by her dance abilities, and somehow, she can influence minds — possibly by improvising songs about her subjects. There’s probably more to come, and that’s another strong part of the writing. It’s a satisfying first issue that reveals its secrets slowly, and you don’t mind. The story is just engaging. The rest of Nikki’s theater troupe doesn’t seem to have broken the influence that corrupted them, and I admit I have a soft spot for evil carnivals. The Tap Dance Killer has no place to run but to them, and has to keep them from spreading too much terror. It’s an interesting dilemma. And since the seed of the “Tap Dance Killer” came from music that Sikora composed, I’m kind of hoping for a collection that includes a vinyl album of the score. If the first issue is any indication, that album will be a killer.